Use Your Mouse This screen shot illustrates Pathfinder's graphical user interface. 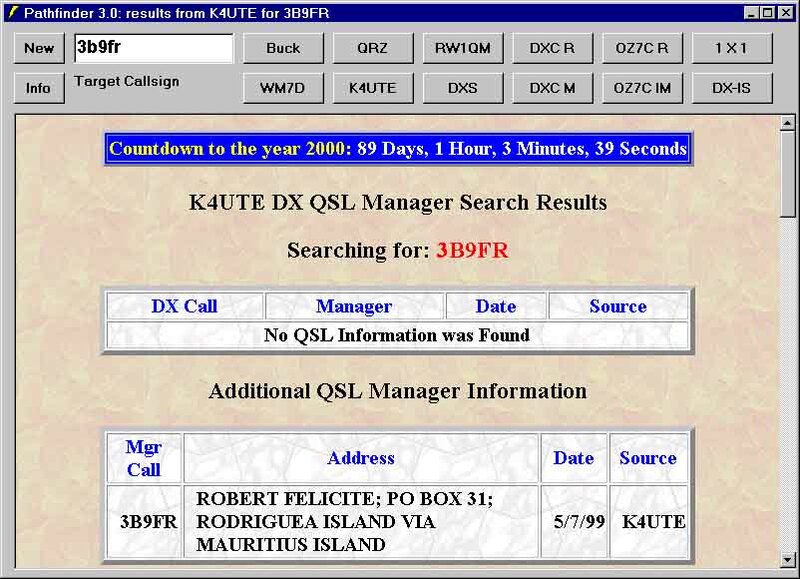 Enter a Target Callsign and then click on the twelve search buttons until you find the QSL route. Pathfinder displays the Stop button while a search is in progress. Click on this button to terminate the search. If you allow the mouse to linger over a search button, Pathfinder will present the full name of the database to be searched. Click the New button to clear the Target Callsign. Click the Info for the latest Pathfinder information. Clicking the button displays the web page you previously visited. Note that this button is not displayed until you leave one web page for another -- either by clicking on a hyperlink, or by clicking on a search button. Clicking on the button displays the web page you visited before clicking the Back button. Note that this button is not displayed until you click the Back button. Or Your Keyboard You can operate Pathfinder without removing your hands from the keyboard - each of the 12 function keys activates a search. Striking keys F1 to F6 is equivalent to clicking on a top-row search button; striking keys F7 to F12 is equivalent to clicking on a bottom-row search button. Strike the Escape key to terminate a search in progress. Strike the Home key to clear the target callsign. 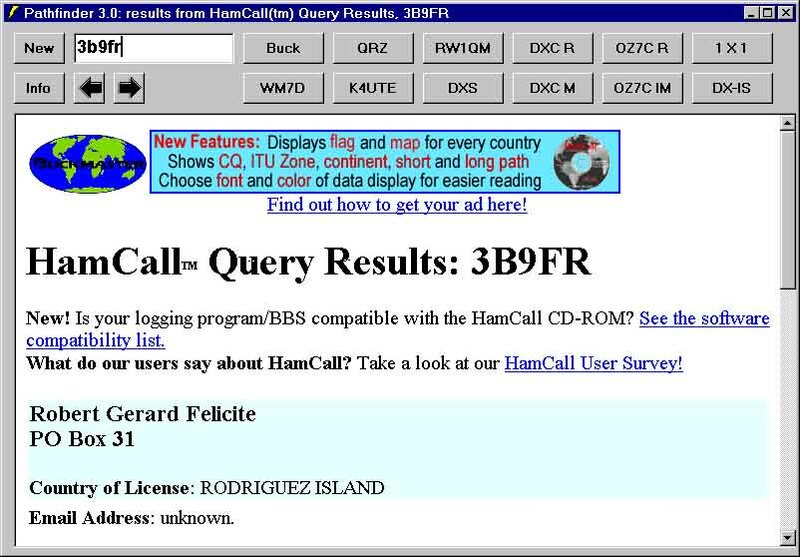 Dynamic Search One second after you enter a Target Callsign, Pathfinder consults a built-in prefix table to determine the associated DXCC country. If Pathfinder knows of a web-accessible callbook for this country, it presents a dynamic search button directly beneath the Target Callsign textbox. Click here for more information using, maintaining, and modifying dynamic searches.